Note: This page contains general information about learning to fly. If you are ready to join the club and want more information about Club Membership and the joining process please visit the Join UFC page. Our PiperSport is the ideal aircraft for flying training. Marketed for ab-initio training, its spacious cockpit and modern glass cockpit lay out make it comfortable and easy to fly. A flying lesson in our PiperSport will cost approximately $328 (inc GST) an hour plus landing fees and ground charge. Please see our Hire Rates and Bookings page for up-to-date aircraft hire information. Once you are a club member, our club instructor/s can guide you through the process and take you for your first flying lesson. University Flying Club members are friendly and passionate about aviation so the best way to find our more is to contact the club or come along to our monthly committee meetings – Members are encouraged to attend, ask questions and meet other members. Attending the monthly meetings is also a great way to keep up to date with events and have your say in how the club operates. The RPL was introduced in 2014 and is a much quicker and more affordable entry method into aviation for many aspiring aviators. A recreational pilot license (RPL) is intended for those who want to fly purely for recreational purposes. It allows pilots to fly light (under 1500kg maximum take-off weight (MTOW)), single-engine aircraft as pilot in command and can be achieved in as little as 25 hours. The RPL also allows pilots to fly without supervision from a flight instructor or flying school once they have earned the licence – this differs significantly from the old GFPT (General Flying Proficiency Test) which allowed student pilots to fly solo with a passenger under remote supervision of an instructor – in reality the GFPT wasn’t very practical and it has now been replaced with the RPL. What if I have a GFPT? Holders of a GFPT are eligible to convert their GFPT to a RPL until 31st of August 2018. 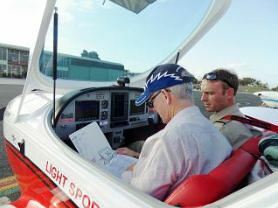 It simply requires completion of an application form and flight review with an instructor. More information is available from the CASA website. What if I hold an RA-Aus Pilot Certificate? You can convert the RA-Aus Pilot Certificate to a RPL. This requires completion of an application form, supporting evidence and a Flight Review. If you have navigation endorsements on your RA-Aus Licence these will be retained with your RPL. More information is available from the CASA website.